The dragonfly is quite the show off when it comes to flying. It can hover in mid-air, maneuver in all directions, and glide without so much as a beat of its wings. 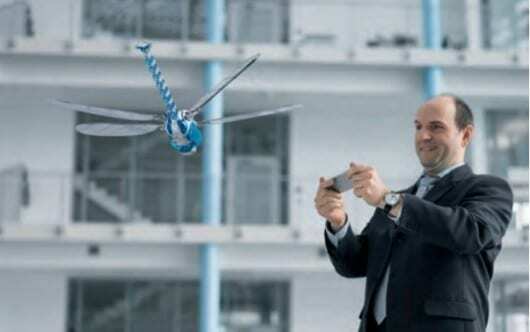 After succeeding in capturing the essence of a herring gull with the SmartBird, the folks over at German pneumatic and electric automation company Festo challenged themselves with the creation of a robotic addition to the dragonfly family – the BionicOpter. Even the largest member of the Odonata clan (a damselfly named Megaloprepus caerulatus) is no match for Festo’s dragonfly-inspired BionicOpter. Its 63 cm (24.8-inch) wingspan almost puts it in the same league as the long extinct Meganeura, though thankfully minus the latter’s reported appetite for other insects and small amphibians. Each of its four wings has a carbon fiber frame covered by a polyester membrane, and can be twisted up to 90 degrees from the horizontal. From tip to tail, the robot dragonfly measures 44 cm (17.3-inches) long. Its sturdy and lightweight housing and mechanical system are fashioned from aluminum, polyamide (sintered) and terpolymer (deep-drawn ABS), contributing to its overall weight of just 175 g (6 oz). At the heart of the beast is an ARM microcontroller, which calculates all of the parameters relating to mechanical adjustment based on input from the onboard inertia, acceleration and position sensors, together with pilot input, then translates these into movement by actuating the servo motors. The complex motion sequences (including flapping frequency of between 15 and 20 Hz, amplitude and installation angle) are handled by the model’s software and electronics, leaving the operator only having to worry about the steering. The model is powered by two LiPo cells and can be remotely controlled using a smartphone or digital spectrum transmitter courtesy of the included 2.4 GHz wireless module.